CARPET: MAXIMUM COMFORT IN YOUR HOME ! There’s no flooring easier to maintain and warmer than carpet. And those looking for the best quality and the lowest price visit Carpetright first. Let us inspire you with our vast selection. From hard wearing twists, sumptuous saxonys, natural look berbers, wiltons or axminsters, at Carpetright you will find the perfect carpet! We also offer a variety of underlays to prolong the life of your new carpet with a choice of prices and qualities to suit your budget. Whichever carpet you are looking for, your first step is Carpetright. With a wide variety of colours, the Imperial is a great choice to uplift a modern home. 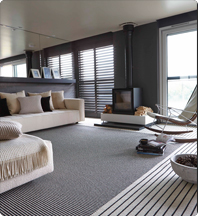 This soft yet hard wearing carpet features a 9mm pile of comfort and style. Made with 100% polypropylene and easy to clean. This deep pile twist carpet has a textured surface which is great for hiding footprints and vacuum marks. Made from 100% polypropylene comes in a variety of colours. A fantastic colour selection, available in both 4 and 5 meter widths. Avery versatile carpet! This practical and versatile tufted twist carpet comes in a wide choice of colours, so you’re certain to find one to suit your home. Made from 100% polypropylene for easy cleaning. This carpet represents outstanding value and is perfect for when you are working to a budget. A vibrant new design in a choice of 4 striking colours.